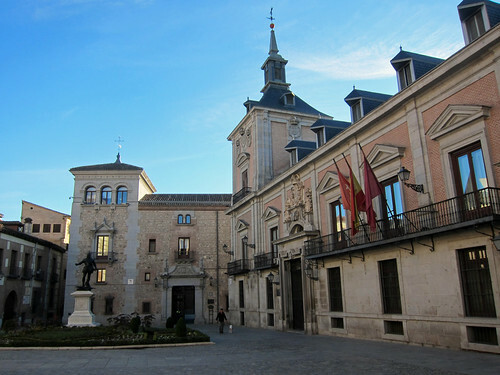 We were in Madrid two weekends ago for just a short time, from Saturday night to Monday night. 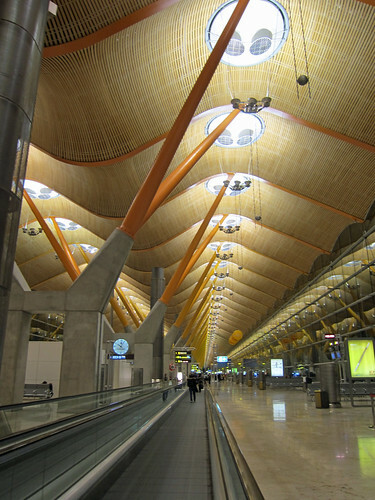 How gorgeous is Barajas Airport? It’s possibly my favourite building in the city. OK, I did say we were there for 48 hours. The first 24 hours were spent on Blai’s work, which was why we were in Madrid in the first place. Now let’s ignore the fact that for the first 24 hours, we only ate Italian food. You know how it is when eating with others! Luckily there were a few good pizzas consumed but I’m not here to write about pizzas in Madrid! The next 24 hours though were fantastic! 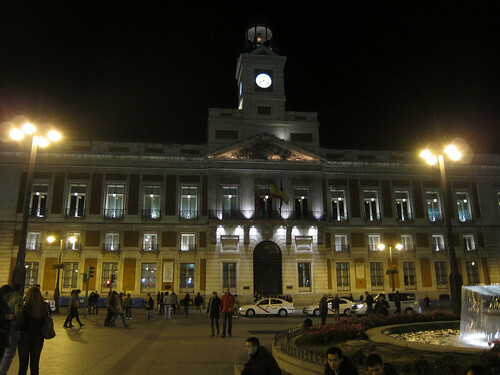 We took the metro from our hotel to the Puerta del Sol and then started wandering. It was Sunday night and all the locals were out, making the most of the weekend. We made our way first to the Chocolatería San Ginés, in operation since 1894. We couldn’t leave Madrid without having chocolate. 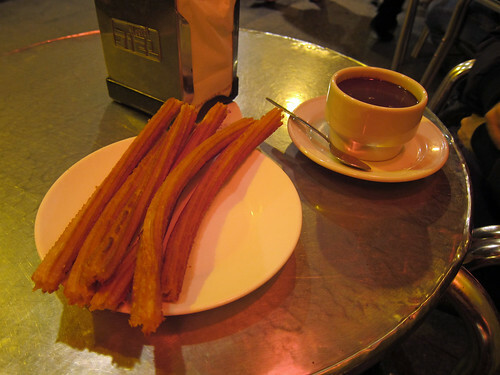 While I held down our table outside, Blai went in to order our churros y chocolate (about €3,60 for both). The receipt is handed to our waiter and he zooms there and back with our plates. The chocolate seemed less dark than the types I’d encountered in Barcelona but I loved the look of their long churros though Blai did miss the Barcelonan ones with their showering of sugar. I was still very happy with my fried dough. 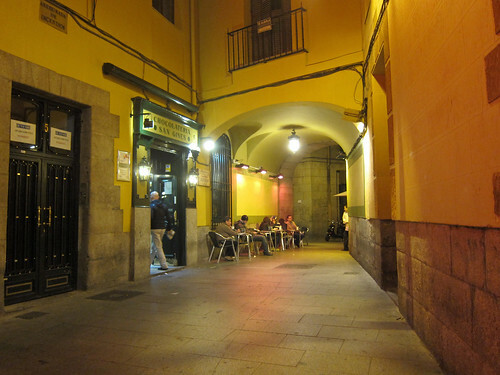 Continuing on with our stroll, we happened upon Calle Cava Baja – the name of a street that a Madrileño I worked with recommended we check out on Sunday night. It’s close to the metro station Latina, where there are many tapas places, all filled with people in total denial that the next day was a working day. We fell into one that looked busy but where we could still grab seats by the bar. This place turned out to be the Taberna los Huevos de Lucio, offshoot of the more famous restaurant Casa Lucio, located just across the street. I recognised the name from a list of recommendations from another Madrileño on Twitter and knew we had to order their eggs. Everyone in the place was ordering the eggs. 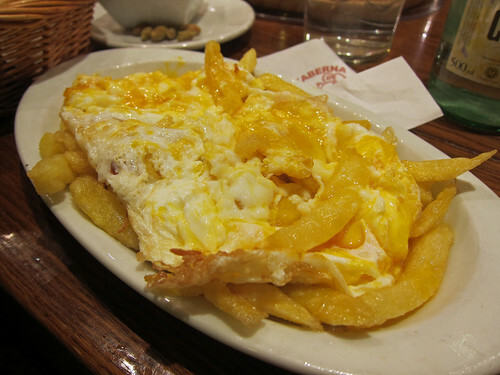 The eggs are their huevos estrellados or ‘broken eggs’. This was a few fried eggs broken on top of a base of chips, coating them in their glorious yolks. It seems like such a simple idea but the eggs were of fantastic quality and they were fried in a way I can never achieve at home. They were delicious! 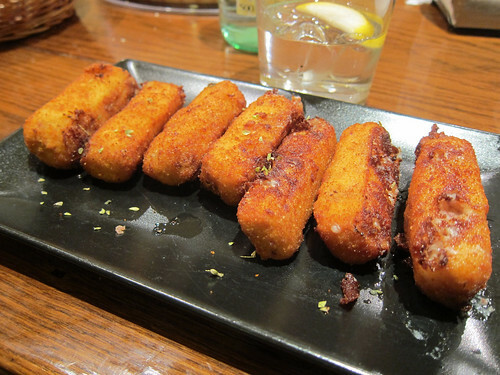 We also tucked into an order of their croquetas, all crispy on the outside and creamy on the inside. They too were excellent though a bit heavy on which to end the night! After a couple of hours at the bar (total bill of about €23 for tapas and a couple drinks), we could barely keep our eyes open (it had been a very long day) and headed back to our hotel. People of Madrid, I salute your ability to party on a Sunday night. The next day, after a big hotel breakfast, we spent the morning at the Museo Reina Sofia, which was just the right size for a couple hours. 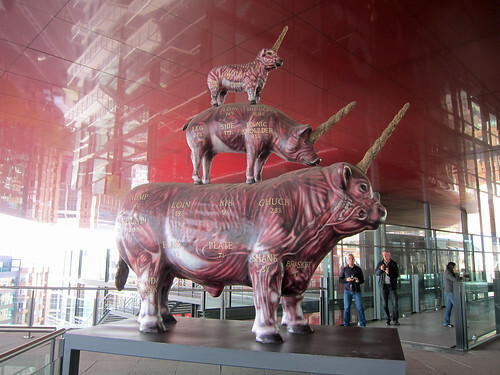 This sculpture (Wheat and Steak by Antoni Miralda) will be pleasing to carnivores. Afterwards, we walked across the centre of the city to the oldest restaurant in the world, Restaurante Botin, established in 1725. It’s look exactly as you’d expect the oldest restaurant in the world to look – all dark wood and cramped insides. For the oldest restaurant in the world, however, it was easy to get a table for lunch on a Monday as walk-ins, service was very professional, and the food was very good! 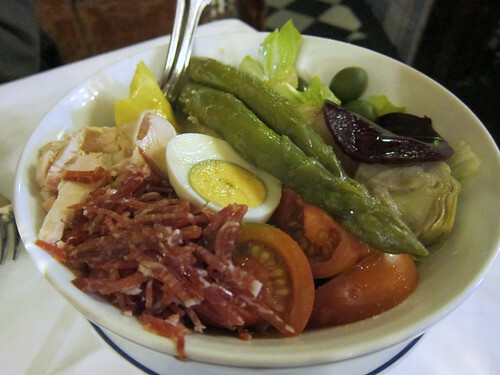 To start, we shared an Ensalada Botin, a great big pile of lettuce, jamon, chicken, tomato, potato, asparagus, artichoke, beetroot and egg in a light vinaigrette that absolutely hit the spot. Sometimes you just need your vegetables. 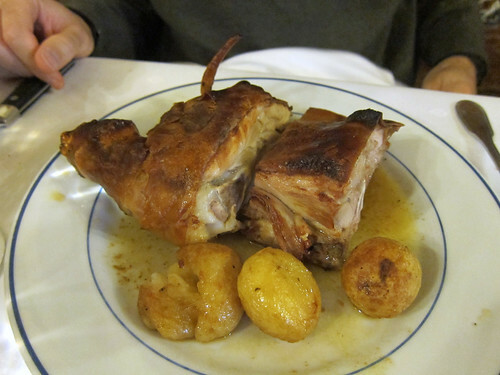 For mains, we had an excellent Cochinillo Asado, about a sixth of a roast suckling pig (a speciality from Segovia) complete with crispy tail! Crispy skin, tender meat…it’s all you want from a roast piglet. 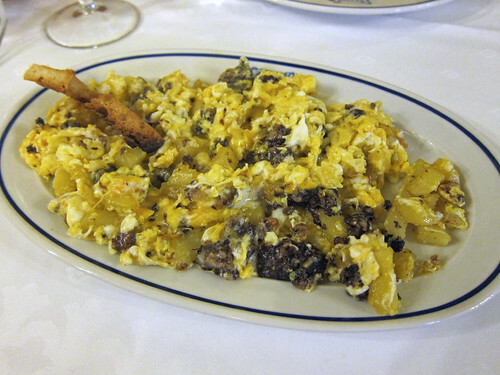 Our other main course of Revuelto de la Casa were scrambled eggs with morcilla (black sausage) and potato. This sure beat the horrendously dry revueltos mixed with half-raw ingredients served at our hotel at breakfast. 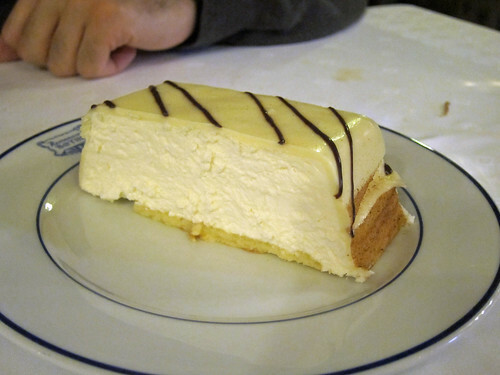 We split a homemade Tarta de Queso con Chocolate Blanco (cheesecake with white chocolate) for dessert. It was incredibly light and went down all too easily. Total lunch bill (it was a big lunch) for food and a bottle of water was about €60. 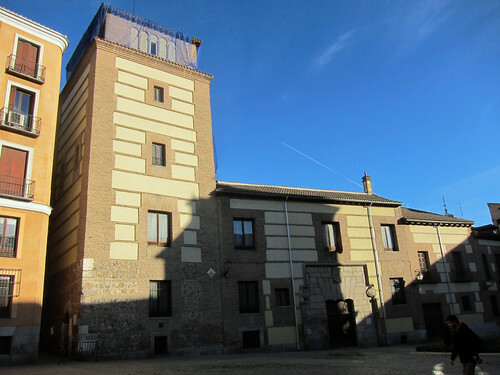 …and this is the Torre de los Lujanes. See that tiny alley on the left of the tower? You want that alley. If you go down that alley, you’ll end up at a square with a church. On the right hand side, you’ll come across this door (I really do have to thank the gypsy woman outside the church who helped us find it!). 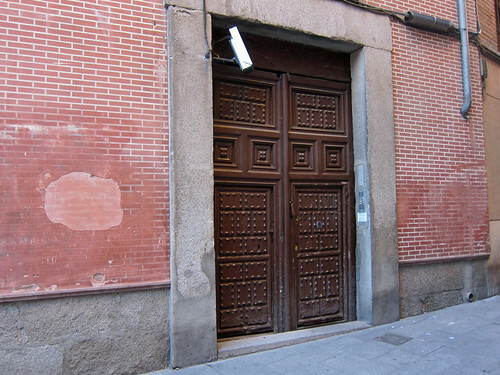 This is the door to the Convento de las Carboneras, a closed order of nuns. From 09:30 to 13:00 and 16:30 to 18:30 every day except Sunday, you can buy sweets and biscuits baked by the nuns. Press the buzzer during this time and wait for a reply – this might take a while as the nun who deals with the public is elderly and has to go down a few flights of stairs. She’ll buzz you in and you follow the signs until you reach a dark corner where there’s a wooden grille through which you complete your transaction with the nun on the other side. Put your money in the grille, the nun will spin it around and collect it and give you your change and your order. There’s a menu of biscuits that they make but that day, the nun told us (all in Spanish) that they had only baked one type of biscuit and we gladly accepted that. Your reward will be biscuits like these! 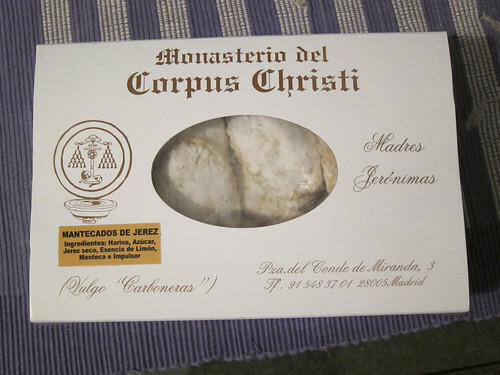 £9 for 500g of Mantecados de Jerez, lardy biscuits with dry sherry. 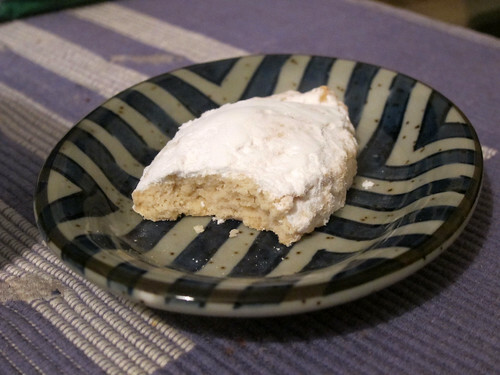 They were crumbly and excellent with their heavy coating of powdered sugar and their fine scent of lemon oil. A fine end to our trip to Madrid! All my photos from this short trip can be found in this Flickr photoset.